308 pages | 27 B/W Illus. 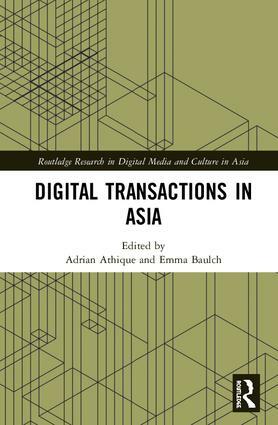 This book presents a comprehensive overview of transactional forms of the digital across the Asian region by addressing the platforms and infrastructures that shape the digital experience. Contributors argue that each and every encounter mediated by the digital carries with it a functional exchange, but at the same time each transaction also implies an exchange based on social relationships for the digital age. In capturing the digital revolution through case studies of economic, informational, and social exchanges from across the larger Asian region, the book offers a richly contextualized and comparative account of the pervasive nature of the digital as both a medium for action and a medium of record. This book series explores Asian culture and digital technologies in a socio-economic, cultural, and technological context. It focuses on not only the celebratory achievement of local popular culture through the analysis of media texts, but also the significance of social milieu in the development of local digital technologies. Books in this series emphasize the economic and industrial aspects of popular culture and digital culture to articulate the relationship between cultural industries, the global market, and government, acknowledging that digital technologies and culture are fundamentally altering the ways in which we communicate.